Your DNA is a string of protein pairs that encapsulate your “build” instructions, as inherited from your birth parents. While copies of it are packed tightly into every cell in, and being given off, your body, it is of considerable size; a machine representation of it is some 2.6GB in length – the size of a blue-ray DVD. The total entity – the human genome – is a string of C-G and A-T protein pairs. The exact “reference” structure, given the way in which strands are structured and subsections decoded, was first successfully concluded in 2003. It’s absolute accuracy has gradually improved regularly as more DNA samples have been analysed down the years since. A sequencing machine will typically read short lengths of DNA chopped up into pieces (in a random pile, like separate pieces of a jigsaw), and by comparison against a known reference genome, gradually piece together which bit fits where; there are known ‘start’ and ‘end’ segment patterns along the way. To add a bit of complexity, the chopped read may get scanned backwards, so a lot of compute effort to piece a DNA sample into what it looks like if we were able to read it uninterrupted from beginning to end. At the time of writing (July 2017), we’re up to version 38 of the reference human genome. 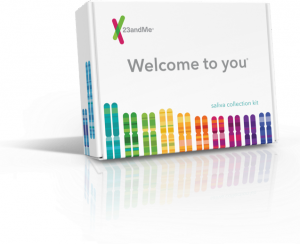 23andMe currently use version 37 for their data to surface inherited medical traits. 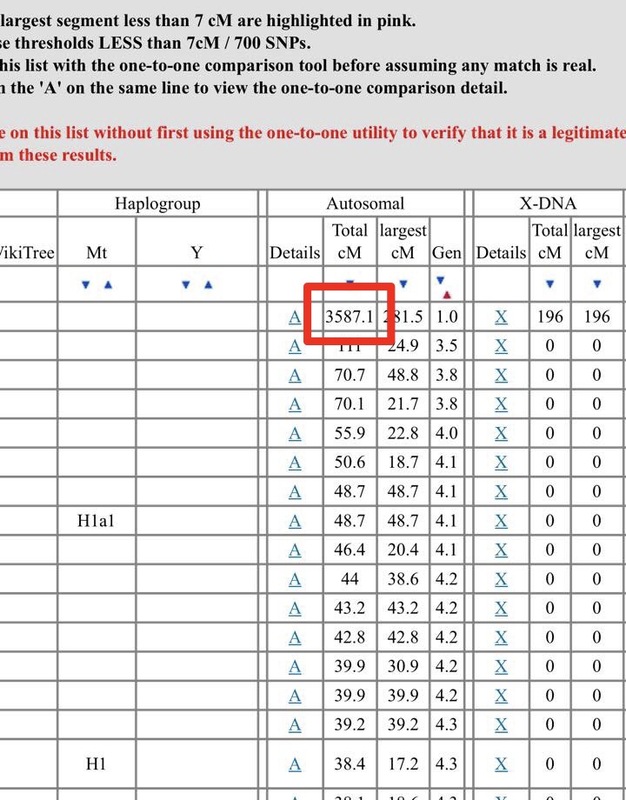 Most of the DNA sampling industry trace family history reliably using version 36, and hence most exports to work with common DNA databases automatically “downgrade” to that version for best consistency. DNA has 46 sections (known as Chromosomes); 23 of them come from your birth father, 23 from your birth mother. While all humans have over 99% commonality, the 1% difference make every one of us (or a pair of identical twins) statistically unique. The cost to sample your own DNA – or that of a relative – is these days in the range of £79-£149. The primary one looking for inherited medical traits is 23andMe. The biggest volume for family tree use is AncestryDNA. That said, there are other vendors such as Family Tree DNA (FTDNA) and MyHeritage that also offer low cost testing kits. The Ancestry DNA database has some 4 million DNA samples to match against, 23andMe over 1 million. The one annoyance is that you can’t export your own data from these two and then insert it in the other for matching purposes (neither have import capabilities). However, all the major vendors do allow exports, so you can upload your data from AncestryDNA or 23andMe into FTDNA, MyHeritage and to the industry leading cross-platform GEDmatch DNA databases very simply. Exports create a ZIP file. With FTDNA, MyHeritage and GEDmatch, you request an import, and these prompt for the name of that ZIP file itself; you have no need to break it open first at all. On receipt of the testing kit, register the code on the provided sample bottle on their website. Just avoid eating/drinking for 30 minutes, spit into the provided tube up to the level mark, seal, put back in the box, seal it and pop it in a postbox. Results will follow in your account on their website in 2-4 weeks. My first social media experience was seeing someone confirm a doctor as her birth father. Her introductory note to him said that he may remember her Mum, as she used to be his nursing assistant. Another was to a man, who once identified admitted to knowing her birth mother in his earlier years – but said it couldn’t be him “as he’d never make love with someone that ugly”. Outside of those, fairly frequent outright denials questioning the fallibility of the science behind DNA testing, none of which stand up to any factual scrutiny. But among the stories, there are also stories of delight in all parties when long lost, separated or adopted kids locate, and successfully reconnect, with one or both birth parents and their families. In order to escape the confines of vendor specific DNA databases, you can export data from almost any of the common DNA databases and reload the resulting ZIP file into GEDmatch. Once imported, there’s quite a range of analysis tools sitting behind a fairly clunky user interface. 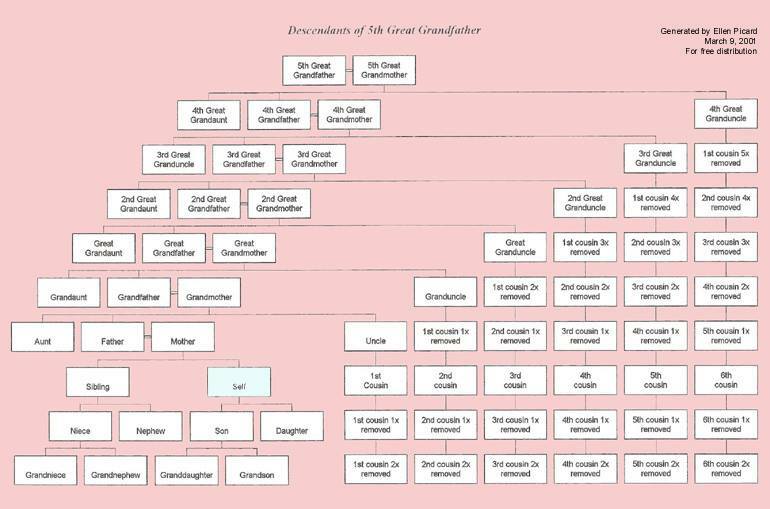 If you want to surface birth parent, child, sibling, half sibling, uncle, aunt, niece, nephew, grandparent and grandchild relationships reliably, then only matches of greater than 1300cM are likely to have statistical significance. 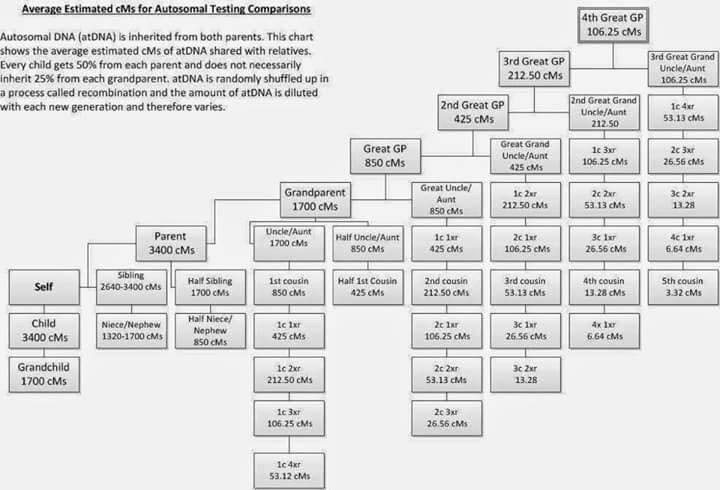 Any lower than that is an increasingly difficult struggle to fill out a family tree, usually persued by asking other family members to get their DNA tested; it is fairly common for GEDmatch to give you details (including email addresses) of 1-2,000 closest matches, albeit sorted in descending ‘close-ness’ order for you). There are more advanced techniques to use a Chromosome browser to pinpoint whether a match comes down a male line or not (to help understand which side of the tree relationships a match is more likely to reside on), but these are currently outside my own knowledge (and current personal need). One of the central tenets of the insurance industry is to scale societal costs equitably across a large base of folks who may, at random, have to take benefits from the funding pool. To specifically not prejudice anyone whose DNA may give indications of inherited risks or pre-conditions that may otherwise jeopardise their inclusion in cost effective health insurance or medical coverage. Current UK law specifically makes it illegal for any commercial company or healthcare enterprise to solicit data, including DNA samples, where such provision may prejudice the financial cost, or service provision, to the owner of that data. Hence, please exercise due care with your DNA data, and with any entity that can associate that data with you as a uniquely identifiable individual. Wherever possible, only have that data stored in locations in which local laws, and the organisations holding your data, carry due weight or agreed safe harbour provisions. Country/Federal Law Enforcement DNA records. The largest DNA databases in many countries are held, and administered, for police and criminal justice use. A combination of crime scene samples, DNA of known convicted individuals, as well as samples to help locate missing people. The big issue at the time of writing is that there’s no ability to volunteer any submission for matching against missing person or police held samples, even though those data sets are fairly huge. Access to such data assets are jealously guarded, and there is no current capability to volunteer your own readings for potential matches to be exposed to any case officer; intervention is at the discretion of the police, and they usually do their own custom sampling process and custom lab work. Personally, a great shame, particularly for individuals searching for a missing relative and seeking to help enquiries should their data help identify a match at some stage. I’d personally gladly volunteer if there were appropriate safeguards to keep my physical identity well away from any third party organisation; only to bring the match to the attention of a case officer, and to leave any feedback to interested relatives only at their professional discretion. I’d propose that any matches over 1300 cM (CentiMorgans) get fed back to both parties where possible, or at least allow cases to get closed. That would surface birth parent, child, sibling, half sibling, uncle, aunt, niece, nephew, grandparent and grandchild relationships reliably. At the moment, police typically won’t take volunteer samples unless a missing person is vulnerable. Unfortunately not yet for tracing purposes. Whether for medical traits knowledge, or to help round out your family trees, now is a good time to get involved cost effectively. Ancestry currently add £20 postage to their £79 testing kit, hence £99 total. 23andMe do ancestry matching, Ethnicity and medical analyses too for £149 or so all in. However, Superdrug are currently selling their remaining stock of 23andMe testing kits (bought when the US dollar rate was better than it now is) for £99. So – quick, before stock runs out! Either will permit you to load the raw data, once analysed, onto FTDNA, MyHeritage and GEDmatch when done too. Never a better time to join in.